A watershed is like a bowl, it is surrounded on all sides by higher land. In Kansas watersheds can be pretty big since the land is not mountainous (some might even call it flat!). But even in Kansas there are highlands and lowlands, and these create watersheds. Since watersheds have higher ground all around them, any water that falls anywhere within the watershed flows to the same low point– like the Kansas River, which is the low point in the Kansas River Watershed. We can see this in the elevation profile of the watershed from Mt. Oread to the Kansas River. 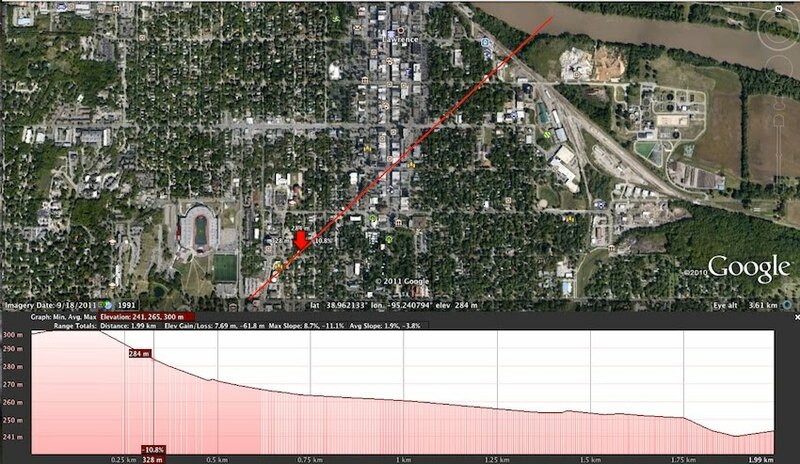 If you start on the KU campus in Lawrence you will walk downhill all the way to the Kansas River. You start at 1000 feet and go down to 800 feet. That’s one side of a watershed. Since the cardinal rule of hydrology is “Water Runs Downhill” you can learn a lot about a river from looking at its watershed. Where is the Kansas River Watershed? The Kansas River begins where the Republican and Smoky Hill Rivers join together at Junction City. It flows 171 miles to Kansas City where it ends by joining the Missouri River. The entire Kansas River Watershed includes the watersheds of the Republican and Smoky Hill Rivers, which means that he Kansas River Watershed drains almost the entire northern half of Kansas and part of Nebraska and Colorado. It is the world’s longest prairie river. 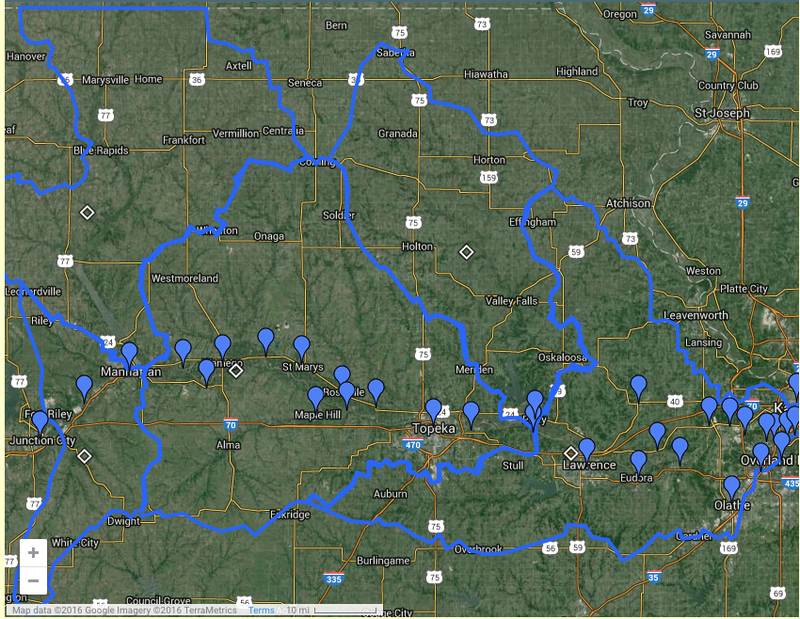 The green area on the Google Map below is the entire Kansas River Watershed–all 53,000 square miles! A watershed can have smaller watersheds nested in it, just as streams flow into rivers. For example, the Smoky Hill and Republican Rivers are smaller rivers that flow into the Kansas River, so their watersheds are nested in the bigger Kansas River Watershed. The Delaware River flows into the Kansas River, and that’s why the smaller Delaware River Watershed is also nested within the Kansas River Watershed. Same with Tuttle Creek. Do you know what’s happening in your watershed? Do you know which one you live in? The Google Map below shows the watersheds outlined in blue. Click on it to go to the full map and learn their names. Then, use the map to see if you can figure out which one you live in. Where your sewage goes to? How about where your electricity comes from? What watershed is your town in?